PLYMPTON– On Jan. 25, the Board of Selectmen held a special forum for residents to give their input on a proposal by Jeff Randall, of 98 Ring Road, to build an indoor medicinal marijuana grow facility on his family farm. In order for the project to proceed, he needs either a letter of non-opposition or a letter of support from the Board. Selectmen may also choose to take no action, or write a letter of opposition, according to Selectperson Colleen Thompson. The room begins to fill prior to the Jan. 25 forum regarding a proposed medical marijuana ‘grow-op’ on Ring Road. 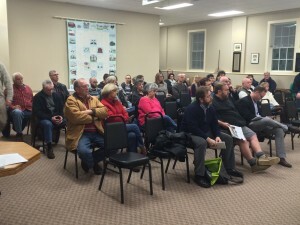 More than 50 residents were present, as was Randall and his representative, Kris Krane, to help explain the proposal. The room was full, with townspeople standing in the rear and on the sides of the room. Some had lived in town as short as three months, while others were lifelong residents. The mood of the meeting was tense throughout, and although never got out of hand, there were certainly some raised voices. Selectmen Chairman Mark Russo began by setting some ground rules, as did Selectperson Christine Joy. Russo then began by mentioning some of the concerns he and the other Selectmen had heard from the public before the meeting. These concerns included odors, the impact of such a facility on area land values, the proximity of the proposed facility to the Dennett Elementary School sending a mixed-message to children in town, concerns of abutters and neighbors and the opposition of the police chief. All of these concerns were brought up by residents at the forum, as well. Randall spoke first, reiterating his presentation given at a Selectmen’s meeting several weeks ago. The facility to grow medical marijuana, according to Randall, would be entirely indoors, with the plants being grown in soil in a 60 foot by 180 foot enclosed building. He previously presented a very detailed written proposal to the Board, explaining the entire licensing process. He specifically noted that he is not proposing a medical marijuana dispensary in Plympton (a place where medical marijuana is sold to patients). There would be a direct payment to the Town, based on the amount of marijuana produced. Randall estimated this at $50,000 a year, although latter appeared to acknowledge that this amount would be negotiable. Maureen Doyle of Ring Road had questions about the application itself. 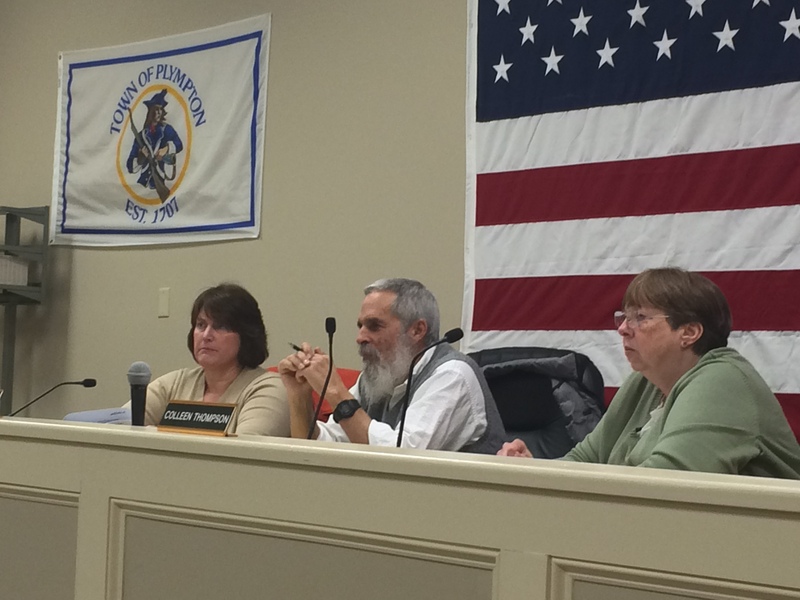 She questioned if the application could possibly allow a marijuana dispensary in Plympton. She asked several times, “Is it possible?” According to the law, it is not (this would require an entirely new application) and Randall reiterated, as did his representative, that he was not proposing this. Doug Reese of Center Street questioned why Randall was not growing the marijuana near a dispensary. Randall and his representative explained that there is no wholesaling in Massachusetts, so Randall will be operating a dispensary, in a yet to be decided city or town. This is legal under the Commonwealth’s medical marijuana laws – and he cannot get his application approved by the State without having both the remote cultivation facility and the dispensary located elsewhere signed off on by the Selectmen in both towns they are located in. They also noted a shortage in supply. There are only four operating dispensaries in Massachusetts: in Ayer, Brockton, Northampton and Salem. According to Krane, they are all experiencing shortages. With more than 18,000 medical marijuana patients in Massachusetts, there is an apparent need for more dispensaries – and thus cultivation facilities, such as the one proposed in Plympton. Several neighbors and abutters of Randall’s then became quite vocal, some expressing that they felt he had misrepresented them in his first meeting with the Board. Randall said that he had spoken to some neighbors, and that they were enthusiastic. Dan Doyle, of Ring Road, stated that he was “personally offended” by the alleged misrepresentation. He also questioned why Randall characterized his conversation with Police Chief Patrick Dillon as “productive” in his initial meeting with the Selectmen if the Chief had written a letter of opposition printed in the Express. While that statement may have been true, and there were neighbors who supported him present, Randall apologized for not speaking to all of them. “I didn’t feel it was appropriate to trap you at your door,” he said to Doyle. As for the meeting with the Chief, Chief Dillon stated that, “Jeff is a nice guy,” and that they had a “nice” conversation, although he would not characterize it as “productive”. He stated that he told Randall that he opposed the idea at the end of their meeting. The Chief believes that for the proposal to be viable, the police would have to hire another officer. The cost to the Town would be about $68,000. He came to that rough number estimating the cost of a second year police officer’s salary and benefits. Chief Dillon opposes the project for Plympton, and posed the question: “Do you really want this in your community?” As well, although not mentioned during the meeting, he later stated in a conversation that he was not opposed to the medicinal use of medical marijuana, he just did not feel that this was a good fit for Plympton. Sharon Housley, of Ring Road had several comments regarding safety. She stated that the security issues are real, and spoke quite emotionally about how in about 20 years of living in town, she’s never felt unsafe. “If we can put it next to an Elementary School, it can go anywhere,” she said. “This whole process is about limiting gangs [having access to marijuana],” Randall said, as several residents started talking over each other, referencing thieves, gangs and murderers being brought to Town. Chris Housley, of the same Ring Road address, was also outspoken in his opposition to the proposal. He expressed that he understood the grow facility would be secure, but was very concerned for his security and that of his neighbors. Krane’s answer that there would be security cameras pointing out was not satisfying to Housley and Russo moved the discussion forward. The Selectmen spoke and asked questions next. Selectperson Colleen Thompson, who is “neither for nor against” the proposal at this point in time, asked about the timing of when the Board would have to make a decision. As Randall still has to finalize the location of his dispensary, he anticipates several months. Thompson asked as well about odor control, and Randall explained that he would be using a system that removed any odor in the exhaust fans before it exited the enclosed building. Thompson also had several legal questions, which Krane answered, including the logistics of getting a bank account for a Federally illegal practice. Krane stated that the Justice Department is now legally bound by Congress to not use its money to interfere with properly state-sanctioned activities that are illegal at the Federal level. Thompson also stated that she had spoken to the Police Chief of Ayer, where a dispensary had recently opened up. She stated that the Chief had said everything was, “so far, so good.” She also suggested to Randall to contact people like the Ayer Police Chief for some testimonials as it might benefit him. Chairman Russo spoke next, and wanted assurances that there would be no odors, pests, or light pollution. Randall and Krane described the odor control system, that there would be little concern regarding pests because the operation would be indoors and thus manageable, and that as for any light pollution, he would work diligently with anyone concerned to curb it. He also stated that it would be an organic operation. Selectperson Christine Joy, who clearly stated her opposition with one of the largest reasons being that she believed the project would be cash flow negative to the Town due to the cost of hiring a police officer, had some questions for Randall as well. 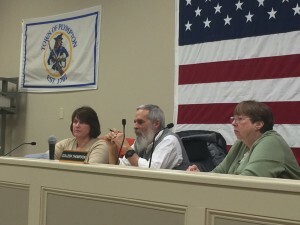 They were more probative in nature, checking in on where Randall was in the application process, notifying him that all other necessary Town Boards and Committees would have to approve the project if the Selectmen did, asking if he had established a non-profit (he had), and what his waste disposal plans were. She had security concerns as well, and wanted to know Randall’s plans. Krane, the representative, stated that it could be whatever the police wanted, but that it was standard for the police to have direct access to the cameras but a private security firm would be constantly monitoring them. Joy, and the Police Chief were both concerned that in the future, if the project is given the go-ahead, could put the Town at risk for grants or funds from the Federal Government. She and Randall also debated whether the proposal fell under the “right-to-farm” by-law, with Joy specifying that she didn’t believe this was a “normal” agricultural practice while Randall insisted that the by-law did not specify what the crop was. Joy did not push this too far as Randall did not seem to want to concede his point. The public was given a second round for comments at this point, and some of Randall’s supporters spoke up. Evelyn Dunbar of Ring Road stated that there have been many, many illegal crops over the years in the area that were well known “secrets”, and that there were no murders. A recent resident who moved from Wareham to Cranberry Knoll, though, disagreed. A youth basketball coach, she spoke of the horrible drug issues that she had witnessed in Wareham, and that she believed it all started with youth smoking marijuana. She did not believe that the grow operation would send an appropriate message to children. Their endorsement was seconded by a Winnetuxet Road woman. In a touching moment, well known farmer Abdu Nassrella of Maple Street, a more than 30 year resident of Plympton said that the Board has a “huge challenge in front of you,” but that “I know Jeff Randall and he’s a class act.” He called him a gentleman, and he also said he had confidence in the Plympton Police Department. He wished to personally vouch for Randall. Next, Frank Santoro of Ring Road, maybe the newest resident in the room having only lived in Town for two months, said that he and his wife had chosen Plympton because it was a right-to-farm community, and that he and his wife fully support and endorse the proposal. A realtor addressed land values after several residents expressed concerns. Jean Cohen of Buttonwood Drive stated that there was no way to know how land values might be affected. She stated when she shows homes near a gun range, some people go running for the door, while those who enjoy target shooting end up excited. She also noted that what she does know adversely affecting property values is the junk in peoples’ yards. Another abutter, Dawn Hastings stated her grave concern for the project, and Susan Hayes of Cushman’s landing expressed concern for the reputation of the community, while expressing compassion for medical marijuana users who are sick. Hayes took umbrage with the term ‘pot’ being used in the newspaper. Finally, Jeff Randall was given a moment to thank the crowd for attending, and said that he hoped that an “arrangement that works for everyone” would be found. Chairman Russo stated that this would be the hardest decision the Board of Selectmen would have to make in his time there, and that he would seek to balance the rights of individuals with the rights of the Townspeople.